In a well-lit kitchen in the Bay Area city of Pinole, Veronica Aguilar pours some water and salt into a boiling pot of red bean soup. Cooking the dish she grew up eating in El Salvador brings Aguilar a sense of comfort during anxious times. Aguilar worries for her 15-year old son and mother, who are now walking through Southern Mexico, after joining an estimated 7,000 Central Americans heading to the U.S. border in a loosely-organized caravan. The former seamstress knows first-hand the challenges they could face, as Aguilar also made her way to the U.S. border with a smaller caravan last autumn. As Aguilar waits for her teen to cover about 2,000 miles of Mexican territory, President Trump has called the caravan including several women and children “an assault.” Trump is reportedly preparing to further restrict asylum protections and to send 800 troops to help border authorities block the impoverished migrants from entering the U.S.
Trump’s heated rhetoric ahead of the midterm elections comes as immigration courts rejected more asylum applicants than in any year since 2009, and illegal border crossings have remained at historically low levels for almost a decade. Border patrol agents made 396,580 arrests at the U.S.-Mexico border in fiscal year 2018, significantly fewer than in the 1980s, 1990s or most of the 2000s. “There's been a long-term trend toward much fewer people trying to cross the border and getting arrested there. And that’s driven by the decline in people trying to leave Mexico,” said Randy Capps, who heads research for the Migration Policy Institute, a nonpartisan think tank in Washington D.C.
Aguilar said she talks on the phone almost daily with her son and 54-year-old mother, who was recently sick with a fever and sore throat. But Aguilar said her mom got medicine after residents of a Mexican town organized to support the migrants in the caravan. For Aguilar, traveling last October with a caravan of 350 people offered safety in numbers and felt like her “only hope” to make it to the U.S. border after fleeing death threats, she said. When she reached Tijuana, she said she walked to U.S. border agents at the San Ysidro port of entry, and sought asylum. The Trump administration has increased the number of people who are kept detained while an immigration judge rules on their case. Aguilar said she was jailed for seven months at a detention facility in Irvine with other asylum seekers in her caravan. “It was very difficult to be detained for that long,” said Aguilar. She said she often felt isolated and couldn’t communicate with her family in El Salvador because she lacked the money for calls. When an immigration judge set a $15,000 bond in her case, Aguilar said she couldn’t fathom how to pay the amount. 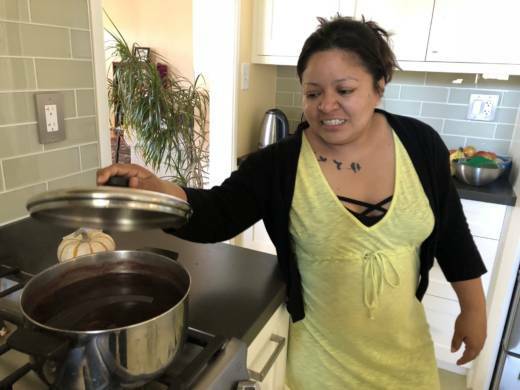 She would have remained in detention, but volunteers with a group called Pueblos Sin Fronteras raised the funds for the bond, she said, and also signed up a Bay Area couple as sponsors who offered her a place to live while she fights for asylum in court. Aguilar was released under electronic monitoring with a black ankle bracelet in June. Two days later, she arrived at Kent and Ann Moriarty’s home in Pinole. The couple had volunteered to visit immigrants in detention and help them communicate with their relatives. But this is the first time they decided to open their home to asylum seekers, said Kent Moriarty, a mechanical engineer. “I want to be able to welcome people that are taking so much risk to improve their lives and escape violence,” said Moriarty, 53, who is also hosting another woman seeking asylum. Building walls and sending soldiers to the border doesn’t seem like an effective response to migrants, he said. 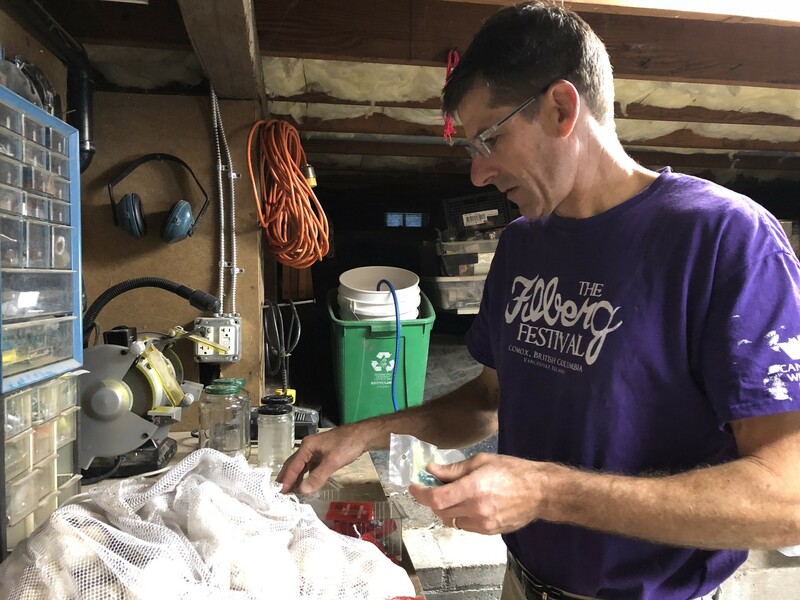 “It seems like a big part of the conversation needs to be what’s causing people to flee and how we address that, or at least talk about it,” said Moriarty, sitting at his kitchen table. In fiscal year 2018, which ended Sep. 30, the U.S. Border Patrol made 107,212 arrests of people traveling in “family units.” That’s the largest annual number ever, even compared to recent years when family migration spiked. Most of the families are from Central America, data show. Severe poverty, gang violence and the sense of a hopeless future are driving families out, said Donald Kerwin, who directs the Center for Migration Studies, an think tank in New York. “They are looking for safety, they are looking for opportunity and a safe place to raise their children,” said Kerwin, adding that some migrants in the current caravan may try to settle along the way in Mexico. For adult migrants who do reach the U.S. border, Kerwin anticipates it’s unlikely immigration authorities will allow most to stay long term. “Most of these people are going to be subject to some kind of expedited removal process. In other words, they are not going to have a day in court,” said Kerwin, citing research by his institute. Under expedited removal, immigration officers can order the deportation of recently-arrived migrants they find within 100 miles of the border with no hearing before an immigration judge. Migrants who convince an asylum officer that they have a “credible fear” of persecution in their country can make a case for asylum in immigration court. The courts currently have a backlog of more than 700,000 cases, and asylum seekers can wait months for a hearing, while often detained by Immigration and Customs Enforcement. While the number of of asylum seekers has grown, U.S. Attorney General Jeff Sessions has cited fraud and abuse in the asylum system and restricted the types of cases that are eligible for the protections. Aguilar said some of the two dozen people in last year’s caravan who applied for asylum have since been deported. Earlier this year, an immigration judge rejected her asylum claim, citing lack of evidence, she said, but a pro bono attorney in Los Angeles is appealing her case. When she was released from ICE detention, Aguilar vowed to not forget her experience or those inside, she said. She began writing letters to dozens of detainees. 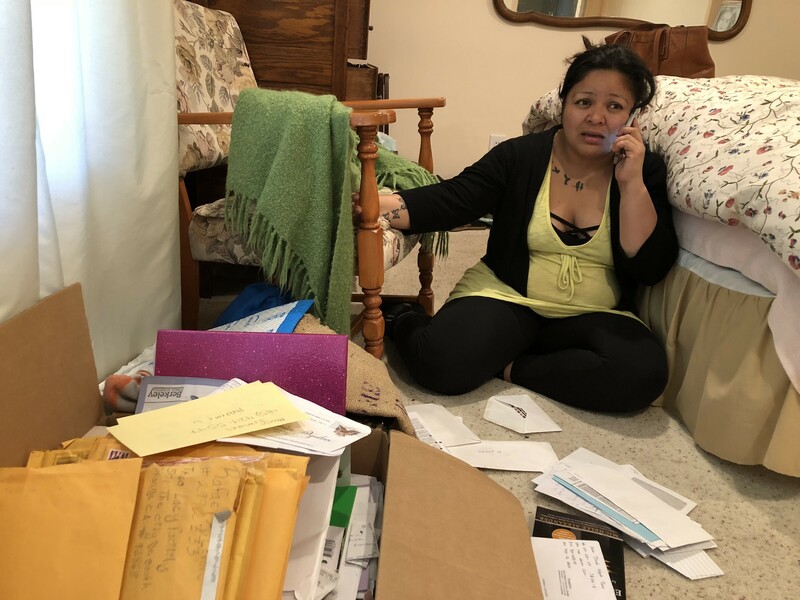 “I want to make them feel they are not alone, that there’s people outside who care about them,” said Aguilar, who keeps hundreds of letters from detainees in a large cardboard box in her bedroom. But Aguilar spends most of her time organizing fundraisers in the Bay Area for the migrants in the current caravan and for bonds that can help free immigrant detainees. On a recent morning, her cell phone buzzed and rang frequently with fellow volunteers on the line. As we spoke, a woman at a detention center called collect to ask for help in raising bond money, Aguilar later said. Moriarty said he’s been impressed by the commitment Aguilar and the other asylum seeker at his home are showing to other migrants. Aguilar said she fled El Salvador after gang members threatened to kill her because she repeatedly crossed through rival territory on her daily walk from home to the gym. She also feared that her son would be forced to join a gang and could be killed she said, which is why she asked her mother to accompany him in the current caravan. After her own journey and detention experience, she said she’s conflicted about whether risking the trek to the U.S. was the right choice. “I don’t know if I’m doing the right thing, but I want to give him a better life. I want him to have a future,” she said.